It’s been twelve years since tragedy struck the senior class of Long Acre High School. Only a few students survived that fateful night—a group the media dubbed The Ones Who Got Away. Liv’s words cut off as Finn got closer. The man approaching was nothing like the boy she’d known. The bulky football muscles had streamlined into a harder, leaner package and the look in his deep green eyes held no trace of boyish innocence. I love a second chance romance. I don’t know what it is but I just adore them. 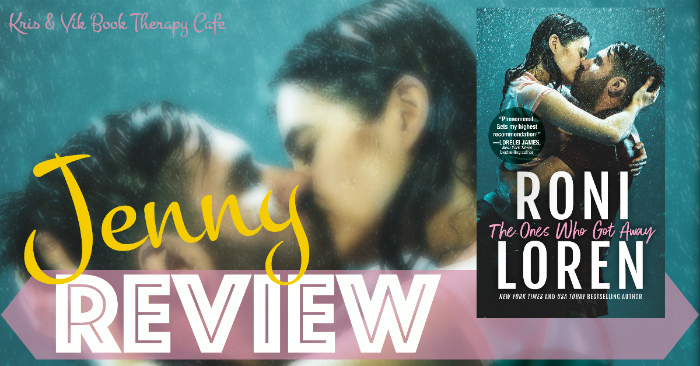 The Ones That Got Away is unlike any second chance romance that I’ve read. Olivia Arias and Finn Dorsey survived the worst tragedy of their lives, 12 years later they are reunited, however, the events of that day still have a profound effect on their lives. The event of that fateful day is brought back to the forefront of their minds and they have to deal with the loss, grief, anger, and regrets. In one summer Olivia and Finn are there to help each other move forward but also learn how to forgive and be able to maybe reconnect on a whole other level. Despite what happened to Olivia and Finn on that fateful day, the chemistry between them did not diminish. Even while reading you can feel the lust permeating off that page, wondering if they will rekindle their relationship or if all the trauma they both been through is beyond repairing what they once had. I was rooting for them and you will too. You will laugh, you will cry and you will have, at times an unbearable ache and a quiet understanding for anyone who have been there something so traumatic. The Ones That Got Away is a book that you will not soon forget and the story was just what I needed to get out of my book funk. He stepped a little closer, his scent drifting her way—some combination of cedar and mint. Like a man who chewed gum while chopping wood. The thought made her want to giggle. She wasn’t sure what the answer was on that one. Probably a little. She doubted she could be this close to him without anxiety bubbling up otherwise. Was she? She hated that question. That was the question she’d probably heard most since that night—and then again when her mom passed from cancer two months later. That was what everyone always wanted to know. Are you okay? “I thought so.” She rattled the ice cubes in her glass and dared a peek at him. But all she got was his familiar profile, the slight bump in his nose from when he’d broken it sophomore year, and the unfamiliar scruff as he took a sip from his drink. It was hard for her not to stare and catalog all the little differences, all the changes time and experience had given him. The harder angles. The dark mess of hair that looked at least two haircuts past neat. Expression that didn’t reveal a thing. He was still Finn somewhere in there, but gone was the boy with the wide smile and the playful attitude. There was a sharpness to him now, jagged edges. Like if she met him in a dark alley, she’d have trouble determining if he was friend or foe. He was quiet for a moment, and she wondered if he was having the same push and pull inside as she was. On one hand, this felt comfortable. They’d always talked easily with each other. But at the same time, they were strangers now. Strangers who had this big, breathing beast between them.